London and New York, 9 December 2013 – Caplin Systems today announced the launch of Caplin Direct, a breakthrough in FX e-distribution. Delivered as a hosted, managed service, Caplin Direct is designed for banks that want a custom FX single-dealer platform, but have previously been held back by the cost and technical challenges involved. Caplin Direct eliminates these barriers by delivering a fully operational single-dealer platform as a service. It works ‘out of the box,’ while still allowing unlimited branding, customization and extension with unique features and workflows. Using Caplin Direct, a bank can bring a state-of-the-art FX online trading offering to market in a matter of weeks, often at a fraction of the cost of an in-house build. Using proven Caplin Platform and Caplin Trader technology, the new service connects quickly and easily to existing e-trading systems, whether vendor-hosted or deployed. To speed the process still further, Caplin offers standard adapters for many popular trading systems. Over 50% of all screen-based FX flow now goes through single-dealer platforms (SDPs), and SDP volumes are up 32% year-on-year, according to the latest figures from the Bank of England. SDP flow is typically four times as profitable for a bank as flow through multi-dealer platforms. While Caplin Direct is initially for the FX market, it inherits all the cross-asset capabilities of the Caplin Platform and will be extended in the near future to address further asset classes including equities and futures. The service includes optional pre-trade content such as news and charting, and can be customized for specific user segments such as institutional, corporate, retail and internal sales desks. 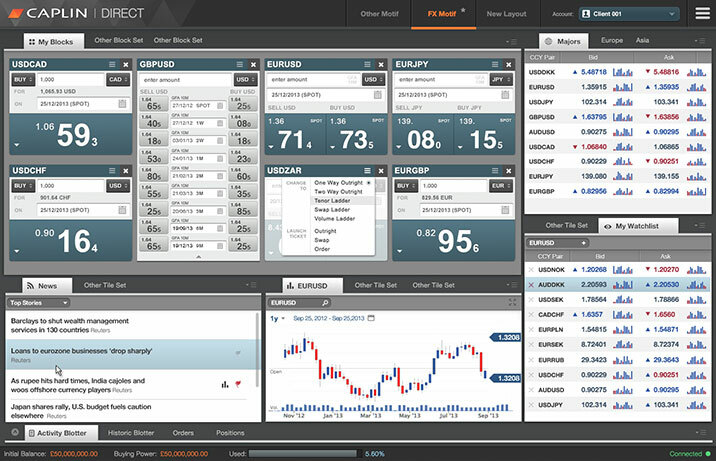 Caplin Direct is available for desktop web clients now, with tablet and smartphone versions coming in Q1 2014.